My apologies to Meghan & Matt, KS and WW...I fear I have allowed the kittens to develop a bit of a bad habit. 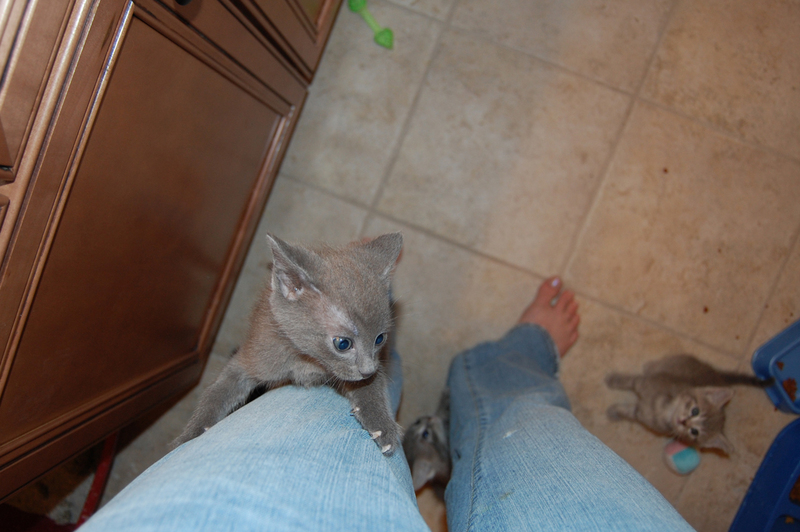 They climb legs. They stay in a small space and it's hard to control five kittens at once...and it really is kind of cute...as long as you are wearing jeans and a sturdy cotton shirt. No silk, no lace, no sheer. They are so sweet. They want to be held and loved. Gentle Ben (soon to be Benjamin Watson, "Ben") is the biggest climber of all - straight up to the shoulders. When Ginger cleans our room, feeds us, changes our water - everything - Gentle Ben is on her shoulder. Cole (soon to be...?) is getting there too - he makes it to her shoulders about 50 percent of the time. Maurice (soon to be Obadiah Jackson, "Obi") isn't quite as agile, but he will definitely climb up to Ginger's lap if she is sitting. Me? I'm a different story. Ginger say's I'm an angel. I don't climb, I just purr and love! Nobody has asked to bring me to their home yet, but I'm staying positive. I hope it happens soon. Does anybody know someone that would want me to live with them? This story is as adorable as can be. I want to tell the world I bit the bullet and entered the Nixon bathroom. I was told I could not enter with my nylon pants...Ginger gave me sweats to put on OVER my nylons....."is this overkill?" I thought to my self. 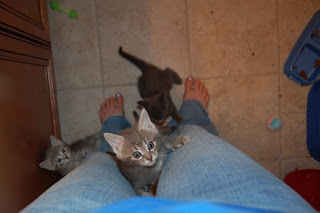 As soon as I entered I was covered with kittens. They climbed up my pant legs faster than speeding bullets and more powerful than a locomotive....."What is happening?" I thought to myself. 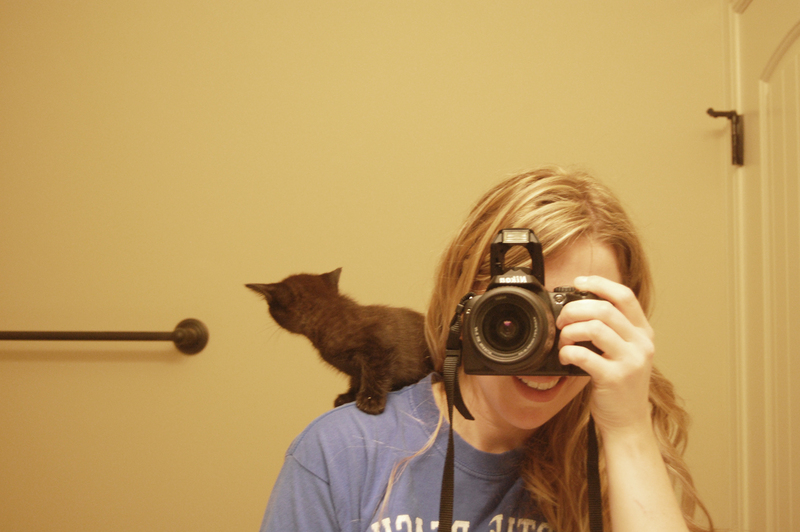 I bent down to put a kitten back on the floor and one was walking on my back. 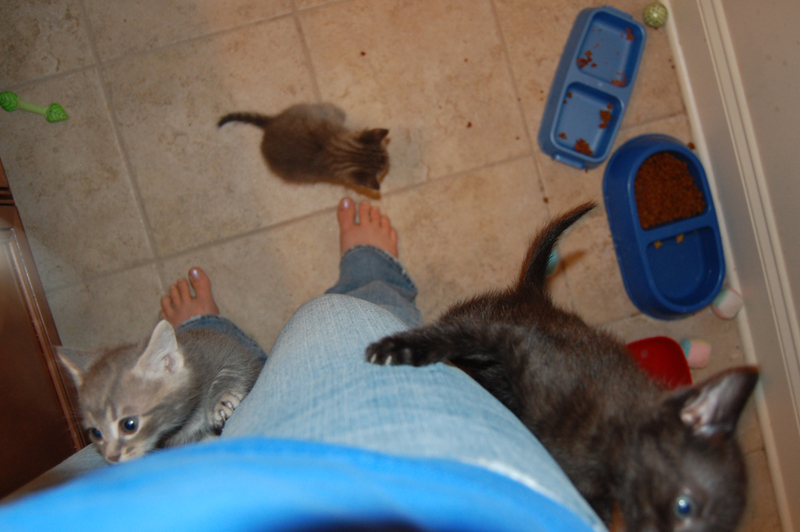 I could FEEL all their nails when they used me as a jungle gym. Let's see....5 nails on each paw......20 nails for each cat.....20x5.......100 nails clawing my legs and back. It was an experience. Sort of like acupuncture? I suppose when your world is limited to a bathroom you might just go nuts when you have visitors. If I lived in a bathroom, would I be climbing up someone's legs too? 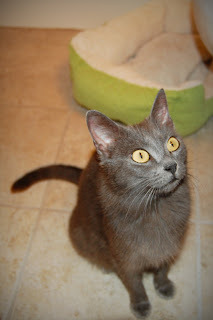 Mama cat (Miss Tuesday) is the best cat of all. She is loving and affectionate and purrs all the time. Good natured. I love her. Who ever gets her hits the cat lottery. So if you visit Ginger and Christopher and you go in this bathroom......plan FIRST to wear your snow pants and fishing boots. I took a look at Ginger's legs and they were all scratched. But I saw the smile on her face and knew that is what was important. She loves each and every one of them. I know she will cry when they go to their new homes.